NBC 6's Julia Bagg shows how officers are hoping to reunited the items with their original owners following an arrest. Police in Miami are trying to reunite stolen goods with their owners after they say a man accused of burglary and grand theft was found with a car full of items. 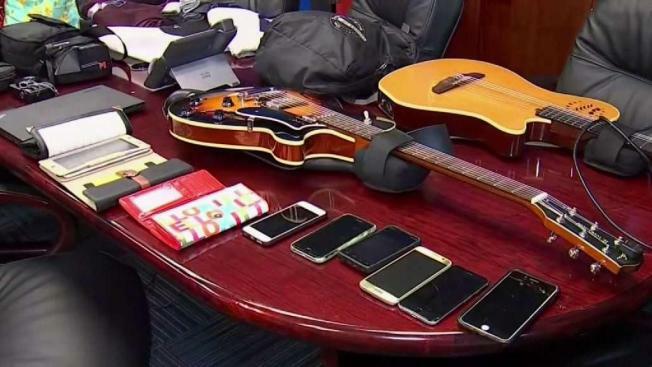 A "host of items" were found in a car belonging to 33-year-old Jose Morales Rodriguez following his arrest on March 30 on charges including burglary, possession of burglary tools, grand theft and criminal mischief, Miami Police officials said. Rodriguez was arrested after he was seen pacing through a parking lot in the area of Northwest 2nd Avenue and 27th Terrace, looking into vehicles and breaking into a Nissan Versa, police said. The incident happened on a weekend when numerous events were happening and many tourists were in town, police said. Some of the items recovered in his car were returned to their owners that day, but many remain unclaimed. Some may have been stolen from tourists' vehicles and may have gone unreported, police said. Victims who want to get their stolen items back can call 305-603-6905, Monday-Friday from 8 a.m. to 5 p.m. to make arrangements.